Throw Footballs, kick Soccer Balls or hit Baseballs off of a Tee at this Giant Inflatable Dartboard! B-B-B-B-B-Bulls-Eye! You choose: kick a soccer ball, throw a football or hit a baseball off of a tee at this Giant Inflatable Dartboard! The velcro ball will stick right where it lands. This AMJ GIANT GAME rental has 3 game options and will be a test of basic skill bringing a fun-filled and on the mark event entertainment! The sports fans at your event will be so pumped when they spot this huge inflatable in the room or in the yard. 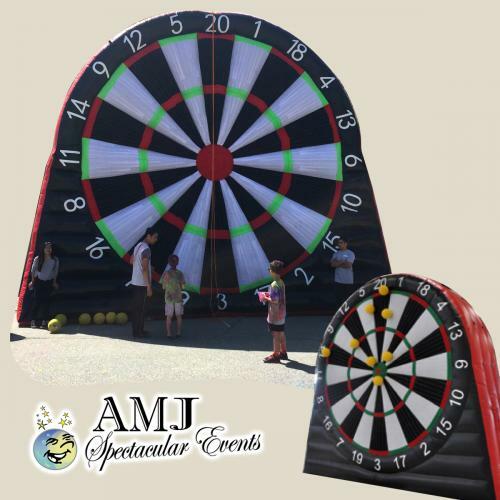 AMJ�s Giant Inflatable Dartboard can be played in 3 ways. Line up the soccer balls and have a tournament called, "Soccer Bull's Eye Kick" and let the friendly competition begin. Throwing a sports or football themed party or event? This giant inflatable rental would be so much fun to have as one of the activities. We all love the greatest game on Earth, so set the velcro baseball on top of the tee and take your swing. Will you hit a pop-up or a line-drive? Aiming it at a bull's eye! Whether you are entertaining friends at a block party, inviting work colleagues to a corporate event, playing around at a school fun fair, or having some competitive college fun, our Giant Inflatable Dart Board is the perfect game for all ages. Let AMJSE take care of all the work - we will deliver, set-up, and take down your Giant Inflatable Dartboard, so all you have to do is enjoy! Contact us now to talk about this, other inflatables, or about the hundreds of other rentals we have ready to help make your party a spectacular event! Looking for other, GIANT games to make your event spectacular? Check out our Giant Connect Four, Giant Light Bright, Giant Jenga and Giant Kerplunk! We have everything you need to have a GIANT classic game themed party!